Please be sure to be present at the October 26th meeting taking place at Kira Derryberry Photography at 6pm to cast your vote as a member of the Tallahassee Professional Photographers Guild. Join TPPG Now-December 2015 for Half Price! Thinking of joining TPPG but just haven’t taken the plunge yet in 2015? Good news! 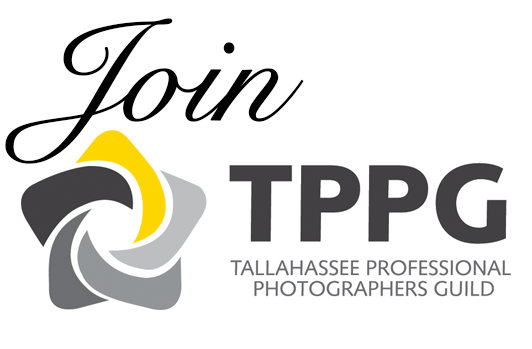 Now through – December 2015 you can join TPPG for half off the regular membership rates. Want to check us out before joining? First time visitors can attend their first meeting for $15. If you decide to join at that meeting, your $15 will apply towards your total membership fee. Visit our Membership section to join and fill out an application. We look forward to seeing you! Save 10% on 2015 TPPG Membership! Renew Today! We at TPPG are so pleased and excited about the growing membership and momentum we’ve gained in 2014. We want to continue that excitement with a special gift to our returning members as well as potentially new 2015 members: a 10% discount on TPPG membership for 2015! If you renew or sign up for a new membership between now and December 11th, you will save 10% off of the regular $149! This discount is available to professional memberships only. Purchase your new membership using the link below OR you can renew in person at the November 20th meeting. Hurry! This special will only last for a limited time! The deadline has passed to renew for 10%. You can still sign up or renew your membership for 2015 at our Membership Page. Welcome back from the holidays! We are excited about a great new year. Keep an eye on the blog and our Facebook Page for upcoming announcements. For more information on our new fee schedule, check out the “Membership” tab. If you have any questions about membership, you can contact our Membership Chairman, Cindy Strickland (cindy@amomentcaptured.com) or any member of our board. See you at our first meeting, January 26!